Ampersand International, Inc. will be exhibiting and making presentations at PITTCON-2011 Conference and Expo in Atlanta. If you are attending, please make sure to stop by our booth #3486 and check out our latest products for chromatography automation. 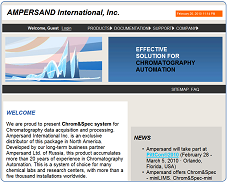 Ampersand International Inc. offers Chrom&Spec line of software products for chromatography data acquisition and analisys. 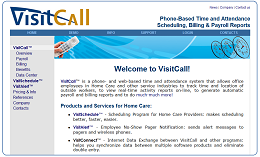 Ampersand International Inc. offers VisitCall line of products for electronic timekeeping and visit scheduling in Home Care and other industries. Ampersand International Inc. offers consulting services and custom software development for Microsoft Windows platform. Our areas of expertise include Database applications, Web-based applications and Computer Telephony. View Consulting Services page for details. Contact us for price quotes. Copyright © 2016 Ampersand International, Inc.. All Rights Reserved.